On April 25, 2016, the PHP website fixed the code. For details, visit the following link. On August 18, 2016, PHP released the latest version with this vulnerability fixed. 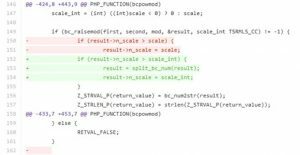 On September 9, 2016, NSFOCUS security team found that www.securityfocus.com had updated multiple local heap overflow vulnerabilities in bcmath.c in PHP, including vulnerabilities assigned CVE-2016-4537 and CVE-2016-4538. The CVE-2016-4537 vulnerability exists in the bcpowmod function in ext/bcmath/bcmath.c. Attackers could exploit this vulnerability to intentionally pass a negative integer to a parameter when calling this function remotely, causing a denial of service or other unspecified impact. The CVE-2016-4538 vulnerability exists in the bcpowmod function in ext/bcmath/bcmath.c, which modifies certain data structures without validating corresponding variables. Via carefully crafted code, an attacker could exploit this vulnerability to launch denial-of-service attacks or cause other unspecified impact. The bcpowmod function in ext/bcmath/bcmath.c accepts parameters without proper validation. In this case, passing a negative integer to the “scale” parameter will cause a denial of service or other unspecified impact. The bcpowmod function is used to calculate the power for the mod module. For example, in the following code, this function is to raise x to the power y and calculate the mod module. The fourth parameter, scale, is optional. When the first three parameters contain decimals, the scale parameter is used to specify the number of digits that appear after the decimal point. If a negative integer is passed to the “scale” parameter, a heap overflow may occur, causing a denial of service. bcpowmod(1, "A", 128, -200); // causes a heap overflow. bcpowmod(1, 1.2, 1, 1); // As the heap structure has been corrupted, a subsequent call to this function may cause the application to crash. 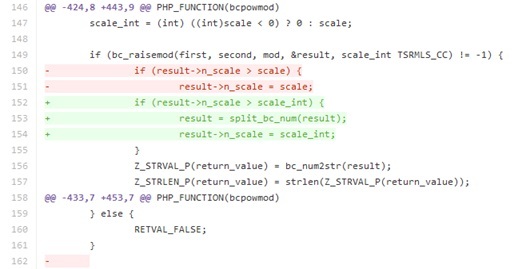 PHP fixed this vulnerability as follows: It introduces the split_bc_num function to ext/bcmath/bcmath.c and enhances validation of the scale parameter in the bcpowmod function via split_bc_num. 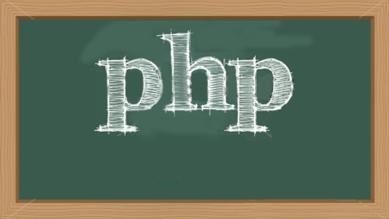 PHP has released the latest version with this vulnerability fixed. PHP users are advised to upgrade their PHP products to the latest version, which is available at https://php.net/downloads. Use NSFOCUS’s remote assessment system (RSAS) to evaluate system security. Short-term service: Contact NSFOCUS for onsite handling to ensure that risk points are immediately eliminated in the network and the event impact is minimized. After the handling, an event analysis report is provided. This security bulletin only describes possible security issues and NSFOCUS does not undertake any warranty or commitment on it. The user shall be liable for any direct and indirect consequences and losses caused by spreading or using information provided in this security bulletin and NSFOCUS and the author of this security bulletin will not undertake any liabilities for such consequences and losses. NSFOCUS reserves all the rights for revising and interpreting this security bulletin. If you want to reprint this security bulletin, you must ensure that it is reprinted in whole, including the copyright statement. 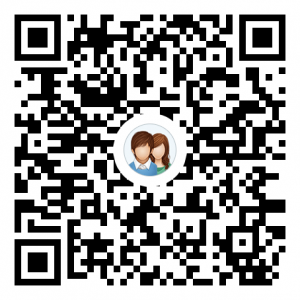 Without NSFOCUS’s prior consent, no one can modify this security bulletin, add any information to or delete any information from it, or by any means use it for commercial purposes.